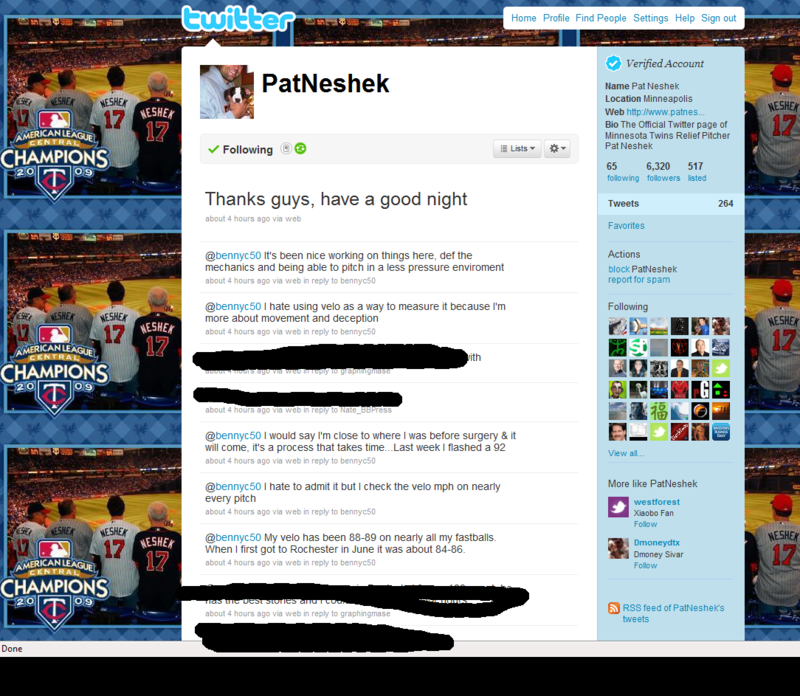 A Pat Neshek Update via Twitter | That's Twins Baseball. A Minnesota Twins Blog. MY RECLINER — Minnesota Twins relief pitcher Pat Neshek came into the 2010 season with a surgically repaired throwing elbow. He began the season up with the major league squad but was optioned to triple-A Rochester in June and has remained there since. With the recent trade for closer Matt Capps and the long awaited call up of Anthony Slama, it feels as if Neshek has been the forgotten man down in Rochester. Talking to professional athletes on Twitter, this generations equivalent to an autograph? Either way it was fun and thanks to Pat Neshek, we hope to see him back in the Twins bullpen soon.